After a bit of a hiatus I’m back! I’ve had a few distractions since being back in London, but here’s hoping that I’ll get into the rhythm of posting again, as I have a vast archive of pictures still to get through that should really see the light of day, otherwise what’s the point of taking them? I’m honoured that people have still been visiting my blog over the past few months, in spite of the absence of new posts. According to my stats I had nearly 500 viewings yesterday alone. So I figured that if people could be bothered to visit the site even when there wasn’t anything new to see, well then I should really start re-earning this attention by posting some fresh material! So, I’m starting with an Indian picture. There is a nice serenity to this scene, shot in Madhya Pradesh I think. I feel at peace whenever I look at it. I remember it was late-afternoon at the time and still very hot. So everyone’s pace, including the dog’s, was very relaxed. 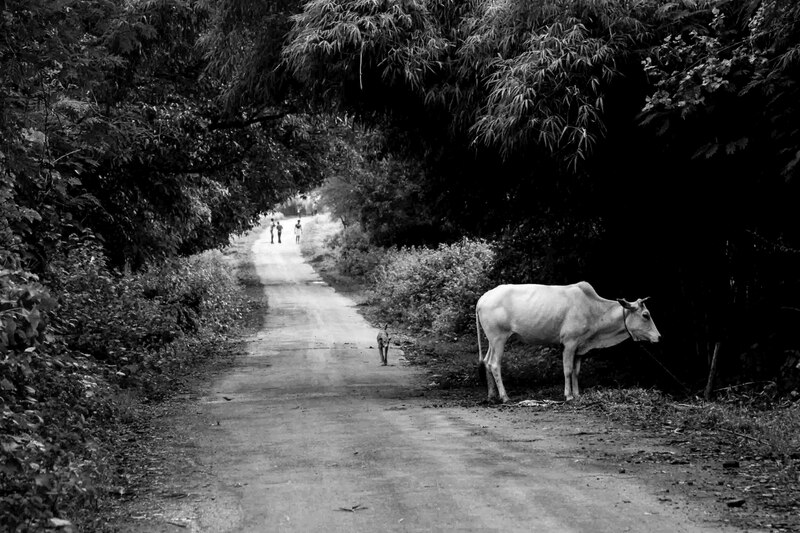 I’m not sure why it seems to work in black and white – maybe because the cow was white, but it just does, for me anyhow. Yes, it would be nice to see more of your archives.